Commenting on a website is the way of voicing your opinion online. Whether you like something or hate something posted on the website, you should be able to comment about it. The comments lead up to healthy discussions which can sometimes, change the mindset of the people reading it. The reality about an article or a truth behind a claim can only be realized by reading comments. However, many websites, social media pages and blogs have made commenting difficult for everyone. Commeta allows you to comment on any webpage and share your thoughts irrespective of what the admin of the web page has decided about comments. On the internet, several webpages limit commenting due to various reasons. Some websites that sell products or services disable commenting because they don’t want other people to know that the service is bad. If you have a bad experience with the product or website content, you should be allowed to voice your opinion. In fact, it is your responsibility to do so. Commeta is a browser plugin that installs as an addon to your browser. 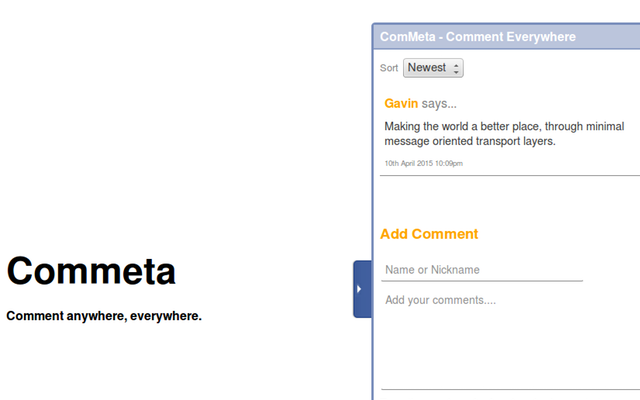 When you visit a webpage, you can comment directly on the page using commeta. Commeta is the best commenting application because you don’t have to download and install any program. The application is a browser plugin that runs as long as your browser runs. 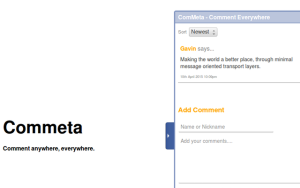 Whenever you visit any webpage, you can quickly comment and read previous comments using Commeta. The best part of this commenting application is that you don’t have to register with the website or give any information that can identify you. Commeta opens up an opportunity to speak your mind and share whatever you want. This is especially helpful if you want to prevent people from falling victims to fake ads in online classifieds and job boards. You can also use commeta to comment on property listings, news articles, videos and blogs. Basically, you can comment on any webpage even if the moderator has stopped accepting comments. Comments are crucial for a healthy discussion on important matters while allowing everyone to share their knowledge. Commeta is a free program that costs you nothing to download and install. It doesn’t slow down your browser and it enables you to place your comments without worrying about permissions. Other people will read your comments even if they don’t have commeta software. With a unified commenting system, you don’t have to worry about captcha that is available with every website that allows commenting. You don’t have to waste your precious time on filling out the captcha entries because commeta automates the entire commenting process. The commeta application can be used with any browser such as IE, Chrome, Firefox, Safari and others. The team behind the application works relentlessly to extend browser support. Installing the add-on only requires a few clicks. Once installed, you can open any webpage on the browser as usual and comment on it on the go. You can easily connect with other people and share your extensive knowledge without worrying about a suitable platform for it.